LOS ANGELES, CA. (THECOUNT) — Dr. Dre may want to rethink not deleting his social media post goofing on embattled college admissions scam parents and kids, after it was revealed his daughter posted a similar “not so excited about going to USC,” on social media in 2018. 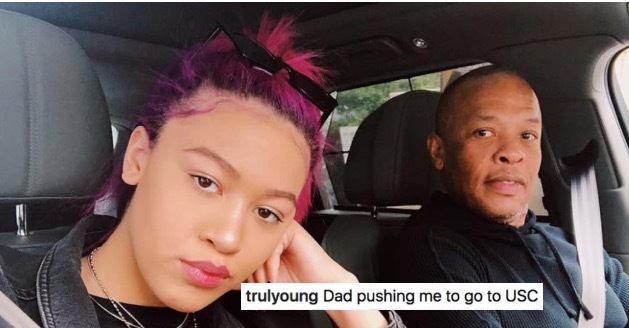 Dre’s daughter, Truly Young, posted last May along with a photo of the pair, “Dad pushing me to go to USC.” Her expression seems to tell the story. 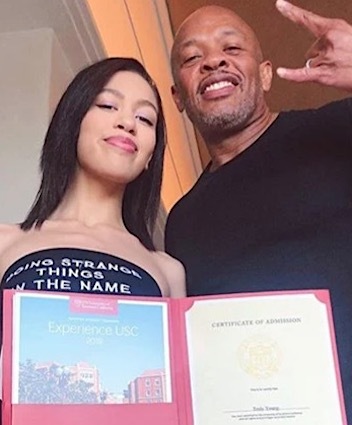 In a moment of lack of self awareness with a splash of irony, hip hop icon Dr. Dre took a jab at high-profile celebrities and other wealthy parents caught up in a recent college admission scandal by boasting of his daughter’s acceptance into the University of Southern California. This despite Dre, 54, making a $70 million donation to the school for the creation of the Jimmy Iovine and Andre Young Academy for Arts, Technology and the Business of Innovation. Record producer Iovine, 66, is best known for his work on American Idol, U2 and Bruce Springsteen. He previously cashed in with Dre on the Apple sale of Beats Electronics. Dre is a former member of the rap group NWA. Dre’s post comes after actress Lori Loughlin was linked in a massive college bribery scheme in which she and her husband allegedly paid $500,000 to have their daughters, Olivia Jade, 19, and Isabella Giannulli, 20, labeled as crew team recruits to get into the school.